Now kochi metro commuters can use skywalk to visit Lulu mall from Edapally metro station. Kochi: A well know mall Lulu in Edapally, Kochi is the first business establishment to connect with Kochi Metro Rail Ltd.(KMRL). A skywalk connecting mall with metro station opened for public on 14th June 2018, Thursday by managing director APM Mohammed Hanish. Kochi marked a new achievement before it’s first anniversary with a great tie-up. The connectivity is expected to bring down vehicular traffic at busy Edapally Junction and make it easier for the public to commute from metro station to mall and back. Skywalk will operate from 9am to 10pm. 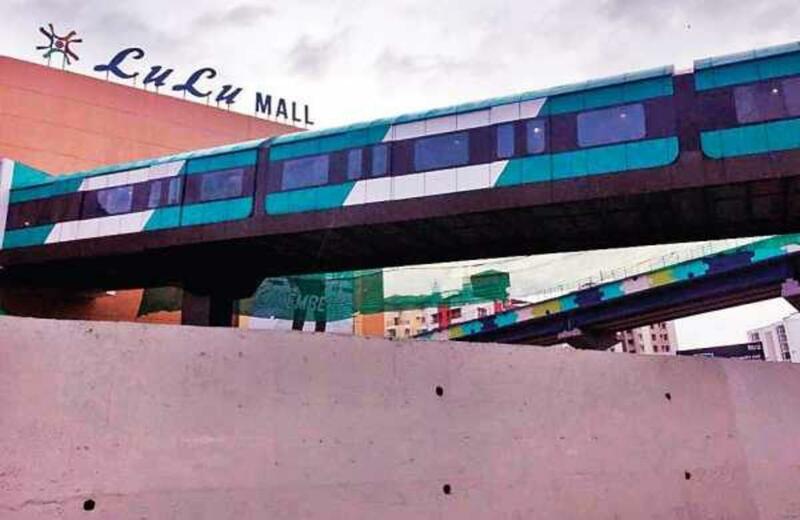 According to the KMRL policy, the entire cost of direct connectivity, including civil work, lighting, additional lifts, shifting of utilities, ticketing office, security cabins and other modifications is borne by the mall as they were keen on having a skywalk link with a metro station. The land licence for the shadow area of the skywalk within the KMRL property equal to 99% of the market value of the land, and a license fee per annum for 35 years have to be paid in advance. There will also be a refundable security deposit of Rs. 10 lakh, which will be refunded on the termination of the agreement, after deducting the estimated deduction costs or damages if any, metro sources said. The skywalk’s architecture resembles the Kochi metro coaches and makes you fell like a metro world. The structure costs of the skywalk is Rs. 5 crore, said a release issued by mall. After this brilliant idea by KMRL and Lulu Mall a couple of other business establishments like Chennai Silks are also in the process of connecting with metro stations through skywalks. This step of tie-up made easy for people as they can now go to Lulu mall through they skywalk without exiting the metro station.